News :: Why Altering a Child's Bike to Become a Balance Bike Doesn't Always Work - Glide Bikes - Balance Bikes for 18 months to 10 years old! Balance bikes are becoming more and more popular by the minute. Parents everywhere are beginning to see and understand the benefits of learning to ride a bike through the exploration of developing balance before learning how to pedal the bike. If you’re still unsure about why balance bikes are a better tool for learning than using training wheels be sure to check out our article explaining the Top 10 Reasons Balance Bikes are Better! Since training wheels are out and pedaling is now best left to learn later, many parents are opting for simply removing the pedals and training wheels from traditional children’s bikes to make their own version of a balance bike. The idea seems like a great one at first glance, but let’s take a look at some of the potential pitfalls with that plan. When your child steps onto a balance bike for the first time, the bike is designed to sit close to the ground, making it easy for children to power with their feet. If you buy your child a properly fitting children’s bike, they will most likely struggle to find the ground with their feet and utilize the seat at the same time. If they are not able to sit down on the bike they are also unable to use the bike to learn balance; they end up simply, “walking the bike,” instead. Balance bikes are created to be low to the ground, creating the ideal platform for children to begin gliding with their bike, instead of just walking it. Glide Bikes and our patented slow speed geometry makes bikes specially designed to balance at super slow speeds. 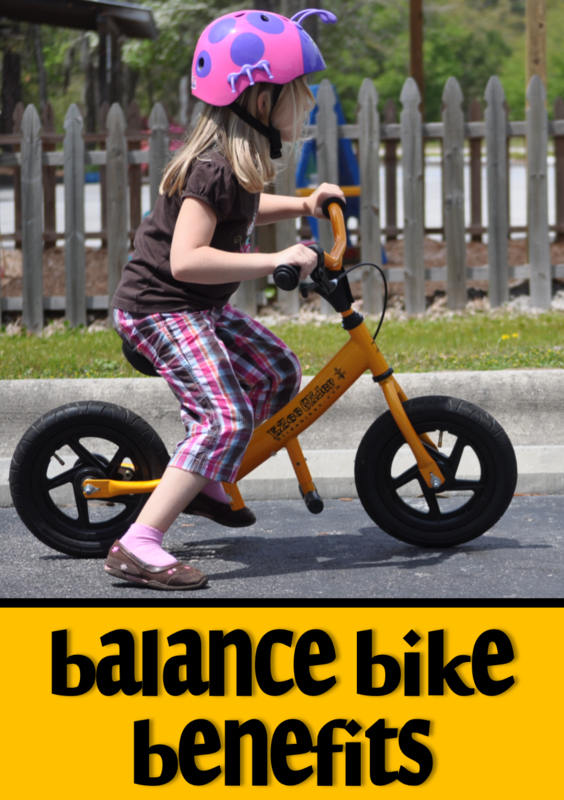 This allows for even the most timid learners to start gaining confidence quickly by being able to balance on a bike that, even when going very slow, still allows them to experiment with proper balance and bike manipulation. Children’s bikes, unfortunately, do not come standard with this type of design. This can cause easy frustration with children who are trying to grasp balance on a bike for the first time. This frustration sometimes even leads to a postponement of your child’s desire and ambition to learn how to ride at all. The last thing you want is your child refusing to even try because of a bad experience. Glide Bikes are also created with a special, lightweight frame, which is intended for use by children as young as 18 months old. Many of these children might not be able to manage handling the heavier bike frames that are found on most child’s bicycles. By offering your children a Glide Bike instead of an altered children’s bike, you can be assured that it was designed to fit the needs and size of your child for the purpose of creating a fun and easy bike learning experience. Kids are having so much fun gliding they don’t even realize they are learning balance. If you are unsure of what size Glide Bike your child might need please reference our sizing chart. Although altering a regular children’s bicycle might seem like it’s a good idea, don’t forget that a Glide Bike is designed in a very special way to facility the easiest transition from balance bike to pedal bike possible. Through creating lightweight, easy-to-balance, properly-sized bikes for children, Glide Bikes can deliver you a tool and toy for your children to learn how to ride the fun and easy way, making this childhood milestone a happy memory for years and years to come.